With the care, skill and quality that Mid-Cal applies to all of our projects, we can provide you with a Vinyl Patio Cover or Gazebo. A durable, safe and easily maintained vinyl patio cover is the perfect way to create a shaded, cooler climate for your homestead while adding additional privacy. Our patio covers can transform a sun beaten environment to the perfect oasis for a family barbecue or for simply relaxing. For our patio covers, Mid-Cal Construction utilizes a 100% virgin vinyl that resists chipping, cracking, water absorption and warping. The vinyl UV protection keeps colors looking rich and consistent. 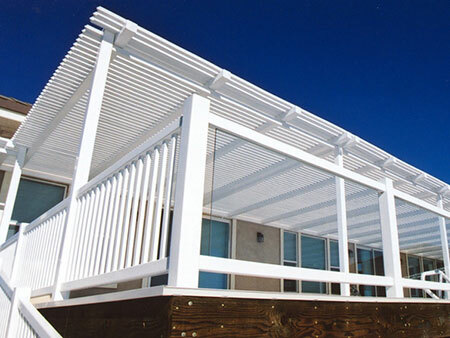 The patio covers are constructed with a fully engineered aluminum support system for stability and a smartly designed connection system with fitted mounts for a seamless appearance. Because there are no exposed fasteners, you won’t have to deal with weakening of railing joints and your installation will remain rust free. 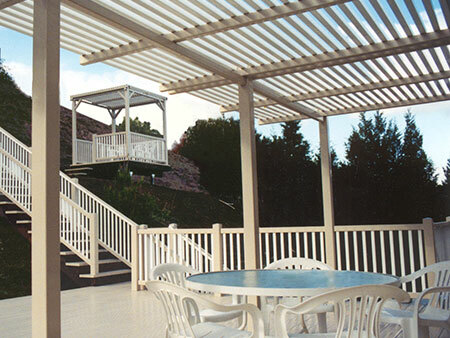 Our vinyl patio cover system is virtually free of maintenance. Just spray with a hose to wash away dirt and you’re done. There’s no staining, painting or sealing required. Your patio cover will look new and maintain their original strength for years to come. Our vinyl patio covers can provide complete protection from rain and sun with a solid roof or a partial protection with an open lattice or louvered design. Our covers can be paired with different styles of handrail and are currently available in white, tan, or clay. For additional customization, our vinyl patio system allows wiring and plumbing directly through the rails for speakers, fans, misters and lighting options. 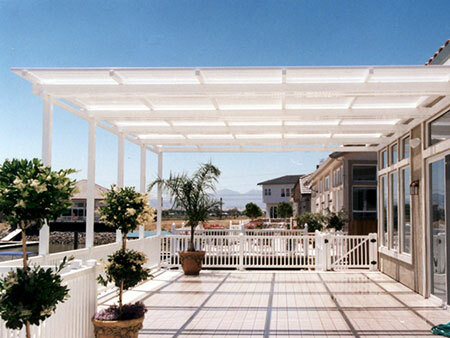 Patio covers are designed to be attached to your home or freestanding.